The curved and conical slitter KSA is one of the most outstanding developments from Forstner. 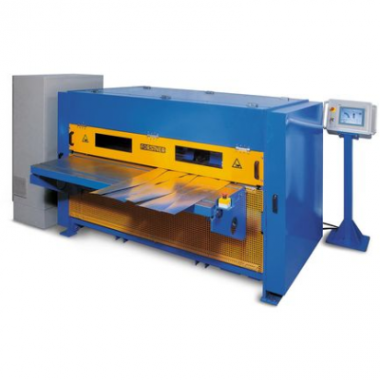 The KSA cuts a sheet or coil in stripes by circular knives similar to a cross cutting slitter AL. The cutting edge is clean, burr-free and without any hardening compared to plasma or laser cut. The KSA can produce max. 5 parallel, conical or curved stripes at the same time. You can use the KSA as a stand alone machine for sheets as well as an integrated part of a coil processing line. Sheet metal parts can be automatically produced after programming on a graphic surface of the touch panel. The software offers standard programs for the ventilation and insulation industry like segment arch, Zeppelin and tier. Each product can be selected, dimensioned and automatically produced. The system also offers a free dimensioning of parallel, conical, concave or convex parts by entering the width at certain lengths of the sheet which is very interesting for long and special metal roofing parts too. The stand alone equipment can be made even more efficient by connecting it to a CAD-CAM system. You can also download DXF files and the KSA produces the parts without further programming.